Unique and challenging achievements on your server! Books, GUI, rankings, rewards, effects and more! Hey, this plugin was working great, but I think I messed something up. Achievement with path (Kills.zombie.Goal) is missing its Name parameter in config.yml. If anyone could help, that would be great. Thanks! Absolutely phenomenal, added this to my vast collection of plugins I'm using on my server. 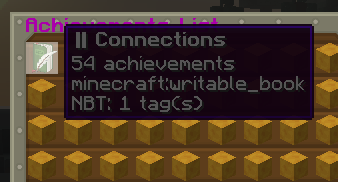 just tested the plugin more in depth, its amazing that you can add so many achievements to the categories and then there are these pervious and next buttons! Is it possible to hide this item (pic below) from the gui? havent tested the custom category, but is it possible to add multiple custom categories? really friendly, active and helpfull author! [AdvancedAchievements] Material "elytra" used in gui.yml (DistanceGliding.Item) is invalid. Have you spelt the name correctly and is it available for your Minecraft version? [AdvancedAchievements] Material "grass_path" used in gui.yml (HoePlowings.Item) is invalid. Have you spelt the name correctly and is it available for your Minecraft version? Please read or ask someone to read for you: "Have you spelt the name correctly and is it available for your Minecraft version?" This is not the support section. Inside the achievement say 'Kills' is their a way to change the inside of the gui ? all the achievements are showing as yellow_terracotta blocks by default but i want to change each to diff block types ! # Items used to represent the categories. Its very nice but i have any Questons. Can i make an Acrhivmenbt if player use a Boiler likes garbage collector or of he tame a Wolf Like your PEt Plugin? Can you add a yml file for us to edit the /Aach help command messages? Have been using this ever since I started using Spigot many versions ago. For the most part it is has been trouble free upgrading... this version included. At some point though, I did have a database corrupt so we lost all our old achievements. Still, not disappointed at all. It adds a nice touch. Nice plugin! Works very well in 1.13! My players love it. There are a couple achievement parameters i would love to see added though. Such as Tavel to x,y,z, activatebutton|lever|pressureplate and falldistance. amazing plugin! My server has been using it for quite some time and players absolutely love it. Many features, frequent updates & friendly dev! Thanks so much for your awesome work!! Easy install, Active Author, fun and glory awaits. Just an easy to enjoy plug. Thanks. Looks like an extrene good plugin but i dont know how to delete the standard achievments, how do i do that? people can just rename a stack of 64 dirts in order to get 64 repairment achievements. they can get over 1000 repairing achievements in a minute or two. Manage flying and related commands on a per world basis! Manage entities, boost performance and reduce lag on your server!